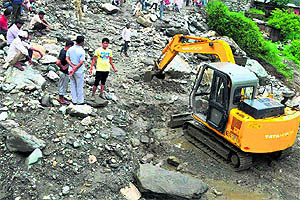 Three months after it raised hopes of a normal monsoon, the weather office has now officially conceded that the crucial season rains would be 15% deficient this season, the first indication of a drought in three years. 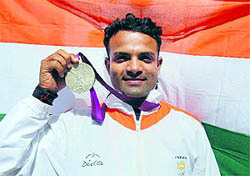 Armyman Vijay Kumar today fought a nerve-wracking battle with five other top marksmen to clinch the silver medal in the men's 25m Rapid Fire Pistol event at the Olympic Games here today. India crash out of men�s hockey after losing to Germany 2-5. Militant outfit Lashkar-e-Toiba�s �commander� in the north Kashmir region, who had a reward of Rs 10 lakh on his head, was today killed in an encounter with security forces in the frontier Kupwara district. Law Minister Salman Khurshid today said the government had decided to set up a Judicial Appointments Commission to replace the present collegium system under which the judiciary had the final say in the selection of judges for the high courts and the Supreme Court. The Supreme Court today rejected the Delhi Police�s plea for enhancing the two-year sentence awarded to Sanjeev Nanda, grandson of former Naval Chief SM Nanda, for running over six persons in 1999, but directed him to pay up Rs 50 lakh and do community service for two years.